When we host an event at Cleveland Charter, AOAT Student Ambassadors step up to welcome and guide guests in any way they can. 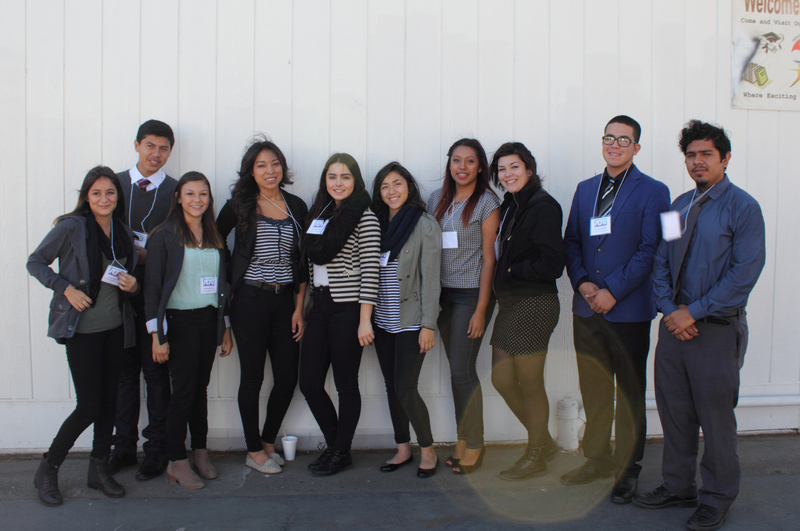 They assisted with the California Partnership Academies regional meeting recently, as well as the Getty Kick Off event. And they will be polishing up their best hospitality in a couple weeks for the annual Career Day. This year five professionals from various arts-related fields will talk to students about their own journeys from student days to fulfilling careers. If you are in the Valley on February 6 between 10:30 and 12:30, stop by for some inspiration! Building on previous years’ experience, Seniors concluded the fall semester of Graphic Design Production class by creating design materials for a client at Cleveland Charter. Some students chose to work solo, others teamed up for the project, but all had to participate in the process of client contact and interaction, preliminary designs, revisions and submission to client of final printed and/or digital files. Clients ranged from other small learning communities, to sports teams and school clubs, to AOAT itself which was in need of logo and brochure updating. 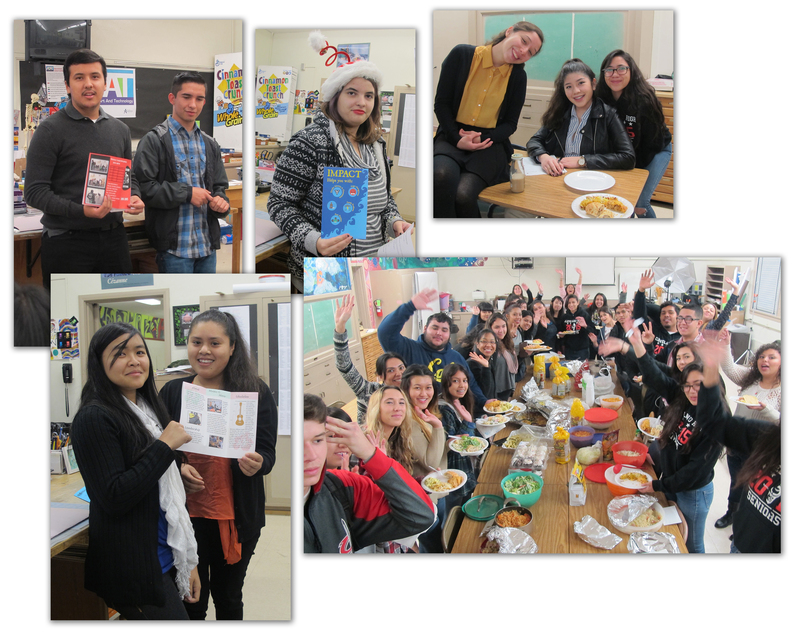 Presentations to the teachers took place during the 2-hour final, and were happily followed by a “healthy pot luck” of only home-made dishes – Yum!! Only one semester to go, Seniors!!! These 11th graders are consulting with each other on ways to improve their preliminary brochure designs. Such “peer critiques” happen frequently during a project and enhance communication skills, as well as building self confidence. 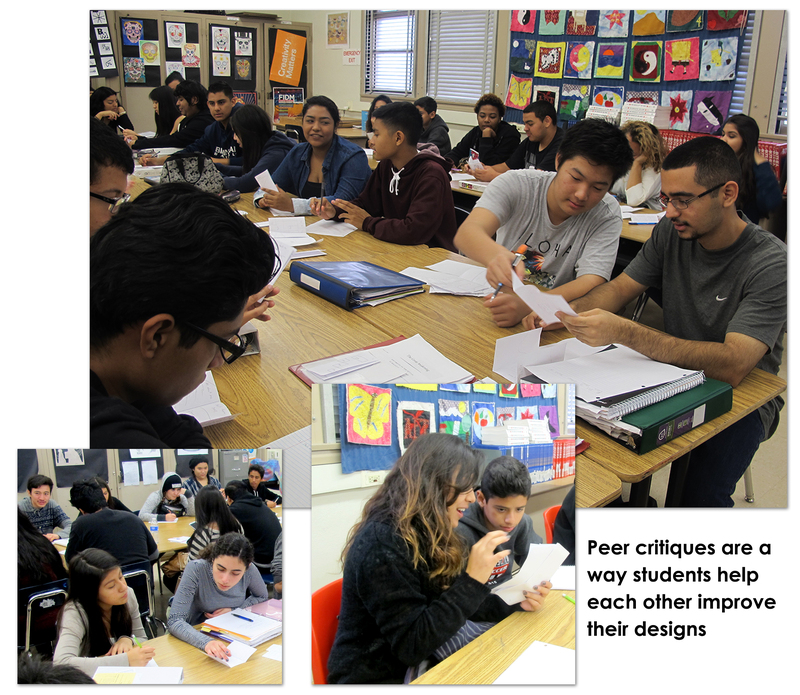 When students care about their work enough to defend their choices to their classmates, they get real-life practice in what is involved in creating successful designs for clients. Alum Kathleen Delos Reyes is pursuing her long-held passion: a medical career! She’s already working on her Master’s Degree and loves learning. She will be a compassionate practitioner one day and we hope she’ll continue to inspire Academy students with her dedication to her goals. Omar wanted to be an architect when he was a junior in AOAT, but after he experienced a year of college changed his mind and set out to learn how to be an entrepreneur – by doing it! He visited recently and showed students his new line of streetwear shirts and accessories called Triumvirate. College and Career preparation are at the core of AOAT’s curriculum, and our graduates validate that both strands of post-high-school focus are serving students well as they leave Cleveland to follow their own paths in life. Each year the Getty Center hosts a working artist for a residence that connects that artist and the museum with local arts groups, usually with students in area schools. Cleveland is excited to be part of the chosen populations for 2014-2015! 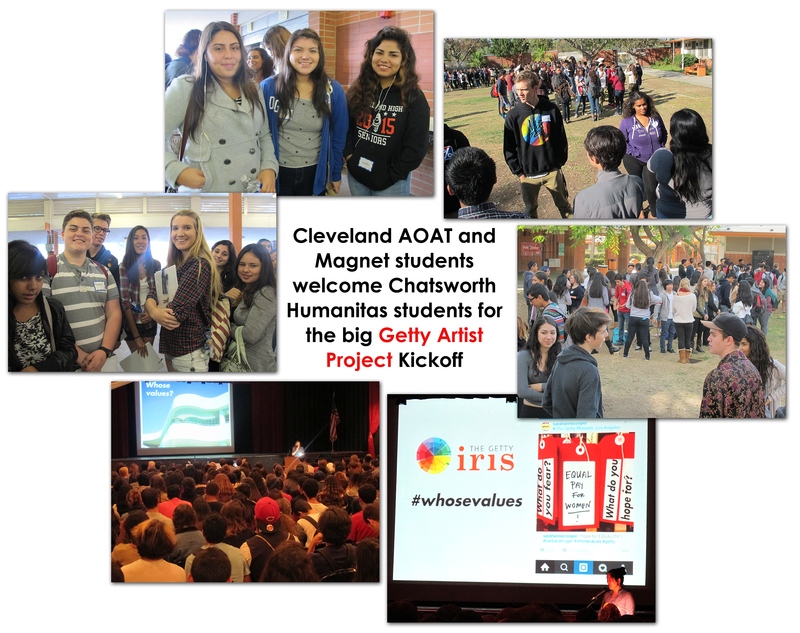 Both the Humanities Magnet 11th grade and the Academy of Art and Technology 12th grade and Social Media class joined to host Chatsworth High’s Humanitas seniors for the kick off event which brought together over 500 students to meet and dialogue with artist Barbara Kruger. Kruger’s works range from major environmental installations in museum spaces to large wall art, all of which incorporate text that questions accepted values and perceptions. Her work was first acclaimed during the early feminist art movement of the 60’s and 70’s and continues to invite interpretation and activism. Cleveland’s Magnet provided breakfast and lunch for the gathering, and organized ice-breaker games for the varied groups to get acquainted. The presentation by Getty staff and the talk by Kruger invited students to contribute their own ideas and reactions to the prompts that provide the starting point of the art making. Many questions and comments from students were graciously and generously responded to by Kruger, who is also an educator at UCLA and loves the creativity of young people. Students and teachers alike are looking forward to this 2-semester project, which will culminate with the student-created artwork being installed in the Getty Center lobby in spring. Keep checking here for updates on progress!